I love this one but had to modify it (I have very long, very thick hair and it just wouldn’t stay up). I split my hair into three sections; instead of tucking and pinning the middle one, I knotted my hair and used a barrette to hold it up. I found braiding the side pieces held up more than twisting. I use a regular headband instead of a banded head band as I found that stays in place better. Super cute and lots of compliments! This is my go-to hairstyle, especially in summer. I skip the teasing for a more streamlined look. 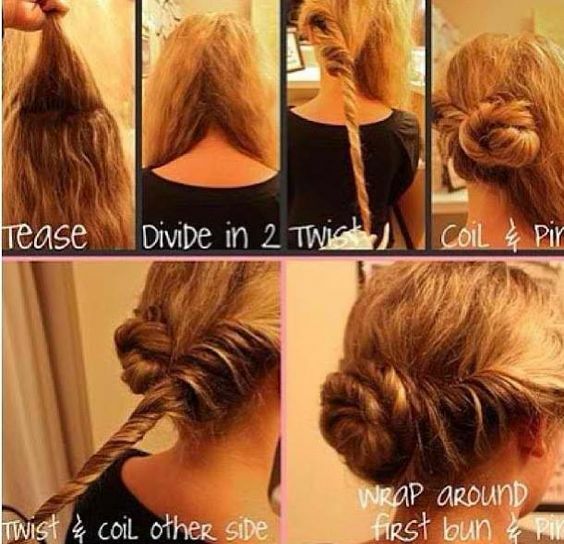 It’s cute for day and super easy (make sure you have bobby pins!). Plus, when you let it down at night, your hair is in the most perfect messy and beautiful waves you could imagine.